SBA celebrates, connects, and empowers service member (including National Guard and Reserve), veteran, and military spouse entrepreneurs and business owners—past, present, and future—during 2017’s National Veterans Small Business Week (NVSBW). NVSBW, now entering its fourth year, raises awareness of veteran business ownership and encourages communities to support their veteran- and military-owned businesses. It also inspires business support and mentorship within the veteran and military community, while connecting these business owners to entrepreneurship resources administered through OVBD and its stakeholders. Perhaps most importantly, NVSBW ’17 is an annual renewal of the national commitment to veteran business ownership, while highlighting its positive impact on the U.S. economy and the ongoing challenges faced by the veteran entrepreneurship community. We at SBA invite you to join us in igniting the conversation around veteran entrepreneurship. Join the conversation using #MyVetBiz, or register for a MyVetBiz event near you! 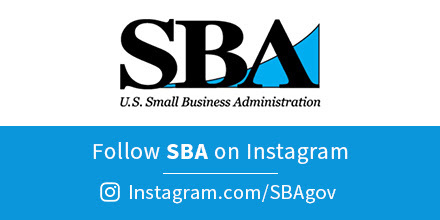 SBA and its resource partner network host and participate in a variety of business events and workshops designed to provide you with helpful advice and connections so you can start a business or grow an existing one. Listed below are upcoming events either attended or hosted by SBA and/or its Resource Partners- SCORE, the SBDC network, and the Women's Business Centers. SBA Resource Partners are funded in part through a Cooperative Agreement with the U.S. Small Business Administration. Check out the official SBA YouTube Channel. The free classes in our local SBA training program are made possible by the generous support of volunteer presenters. We appreciate their time and expertise. Presentations listed in this message do not represent an endorsement of the presenter's views, opinions, products, or services by SBA. All SBA programs are extended to the public on a nondiscriminatory basis. Reasonable accommodations for persons with disabilities will be made, if requested at least 2 weeks in advance.